Beautiful 5 bedroom villa set over 3 floors, with stunning views to the ocean, Montaña Roja and across the sea to Fuerteventura. 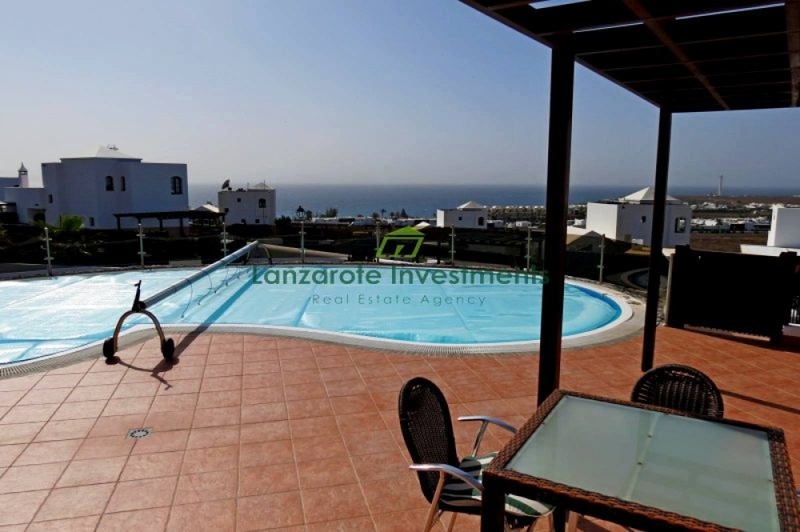 It is ideally as either a full time home or investment due to having the much sought after vacation licence with many forward bookings available . Outside there is a large covered BBQ area with seating for up to 10 guests, large terraces with gorgeous sea views and the heated infinity edge pool 10m x 5.5m. The bright lounge has doors leading out to a sun terrace and amazing pool area. On the same level is the fully equipped kitchen with a separate utility room . Two twin bedrooms one of them having an ensuite shower room. There is another separate shower room. All the bedrooms have doors leading onto small private terraces. A staircase leads up to the upper level where you will find the master bedroom with king size bed, fitted wardrobes and doors leading out to a terrace with incredible sea views across to Fuerteventura , plus an ensuite bathroom with corner bath and large walk in shower . On this level is also another larger private sun terrace to enjoy . On the lower level you have a twin bedroom and a separate apartment. The separate apartment has an open plan lounge/dining area and kitchenette with patio doors leading out onto a small terrace . The double bedroom has an ensuite shower room. Also on the lower level is a games/TV room with flat screen TV and pool table .